Are you fed up with the pests? Isn't your recent attempts failed and wasted your lot of money on sprays and poisons? Want to avoid the risk of these chemicals and hazards? This device is the thing for your sweet home or office! The Ultrasonic Home Pest Repeller is the safest and easiest way to eliminate most of the pest from your indoors! No need to use dangerous and harmful traps and poisons because the ultrasonic waves in this device seriously disturb and the nervous systems of pests, making them run away from your house! 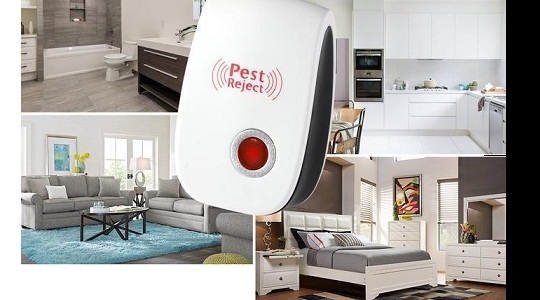 Its smart chip technology emits powerful ultrasonic frequency waves and repels mosquitoes, bed bugs, roaches, flies, spiders, mice, and other animals from your indoors. Probably the safest way to repel pests without harmful or toxic chemicals and irritating noise. Easy plug and play device. For best results, use one device per room so that its frequency reaches the entire floor area. Its best results appear when installing above 30 inches from the floor. A red light will appear after plugging in, and just be sure to keep it away from the things which might block the sonic waves. Just remember, these ultrasonic waves can not pass through walls or floors.